In the past here in Bedrock Dreams I've alluded to some episodes of murderous violence involving gold mining claim disputes that took place in California during the 1980s. One of these incidents occurred in the Northern California Motherlode where I was dredging and highbanking one summer and the other went down in San Diego County where I was living and working at the time. It is the latter incident that forms the core topic of this post. The true story I'm about to relate to you happened on Memorial Day, 1989...nearly 30 years ago now. 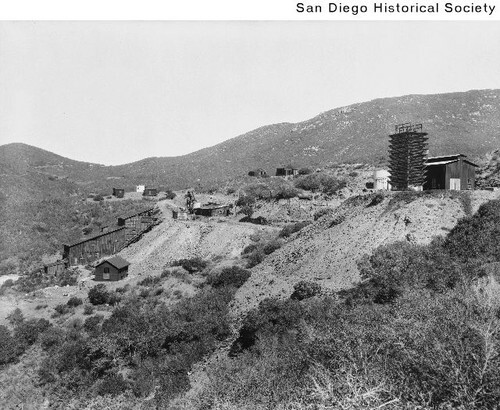 It occurred in a location I was readily familiar with at the time, Chariot Canyon in the Julian-Banner Mining District in the mountains 50 miles northeast of downtown San Diego. The district lies at the northern end of a gold mineralization belt that extends south and southwest through the Cuyamaca, Pine Valley, and Deer Park Districts. I worked a number of placer locations up in these districts (including the area of interest in this post) during the early-to-mid 1980s until safety, claim, and private property issues forced me out. I've written in the past about gold in San Diego County and the Julian-Banner District figures prominently in those posts. Gold was probably discovered in this area as way back as the early 1840s since the historical record points to some placer mining being done there around this time period. But I know from personal experience that the placers in this area are small and limited in nature for the most part. What wasn't small or limited, however, were the numerous lode veins in these districts, especially in the Julian-Banner District. A sharp-nosed gold prospector and miner named Mike Julian recorded the first lode claim in the District in 1870 and from that year until 1880 hard-rock mining continued unabated with $500,000 in gold taken out of the Julian-Banner District in 1874 alone (back when the spot price for a troy ounce of gold was 23 dollars and change). There was another burst of mining effort in the District in 1888 when the Gold King and Gold Queen mines were opened. Another mine that was developed later on here was the Golden Chariot (hence Chariot Canyon). Anyway, it's estimated that a total of $5,000,000 dollars or more was taken from the hard-rock mines and lodes in the Julian-Banner District overall. That's not small potatoes when you consider the price of gold at the time. When gold began to rise significantly in the 1980s, many people in California and other parts of the West got caught up in the gold "frenzy" that was typified by a resurgent interest in small-scale gold mining in all its forms. 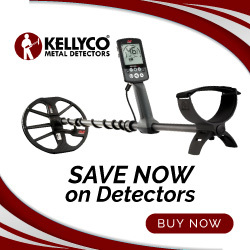 I'd already been at my mining and treasure hunting thing for two years by 1980 and I was a bit taken back by the sudden appearance of large groups of "newbies," including prospecting clubs that seemed to sprout up like weeds at the time. These folks all had a good measure of the gold bug biting their butts and were looking to "strike 'er rich" at old gold ground areas in Cali. This was particularly true in San Diego County (and Southern California as a whole) where I spent a lot of time dry washing and sluicing in the early 1980s. "Rattlesnake" Jim, Sam Radding, and others would probably echo this statement because they were out and about digging the yellow down south at this same time (am I right Jim?). Anyway, the reason I am pointing this out is that there was a lot of interest at this time in the Julian-Banner District which was on public land and open to claim filing, or at least parts of it were, including the old mine locations up in Chariot Canyon. Which brings us right back to the main topic here, the "Shootout at Chariot Canyon" as I like to call it...without any attempt at sounding cute or funny because there was nothing funny or cute about what took place there on Memorial Day 1989. Before I relate to you the sordid story of what happened at Chariot Canyon that ill-fated day, please understand that even today the details are somewhat obscure and confusing since only one group of antagonists survived to tell their side of things. 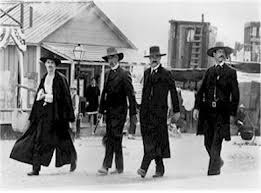 The other side couldn't give their version of the events that occurred at Chariot Canyon because, like Billy Clanton and the McLaury Brothers at the OK Corral, they ended up dead. In fact, the details of the shootout were so one-sided and apparently defensive in nature (according to the surviving shootists, anyway) that the San Diego County District Attorney never filed a criminal complaint and no one was brought to trial or potential justice, if justice needed to be served, that is. So bear all this in mind as I tell this sad tale of a mining claim dispute gone horribly wrong. And remember, the details are sketchy at best. 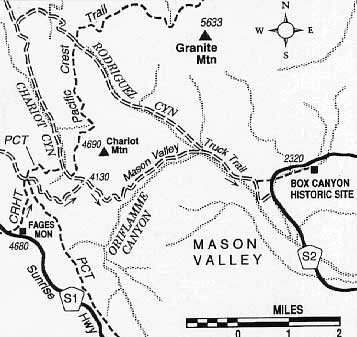 By 1989 numerous lode and placer claims had been filed on gold ground in Chariot Canyon and ostensibly one of these placer claims was owned by Gustav Hudson (age at the time not given) who lived in El Cajon, a suburb about 18 miles east of San Diego's downtown area. 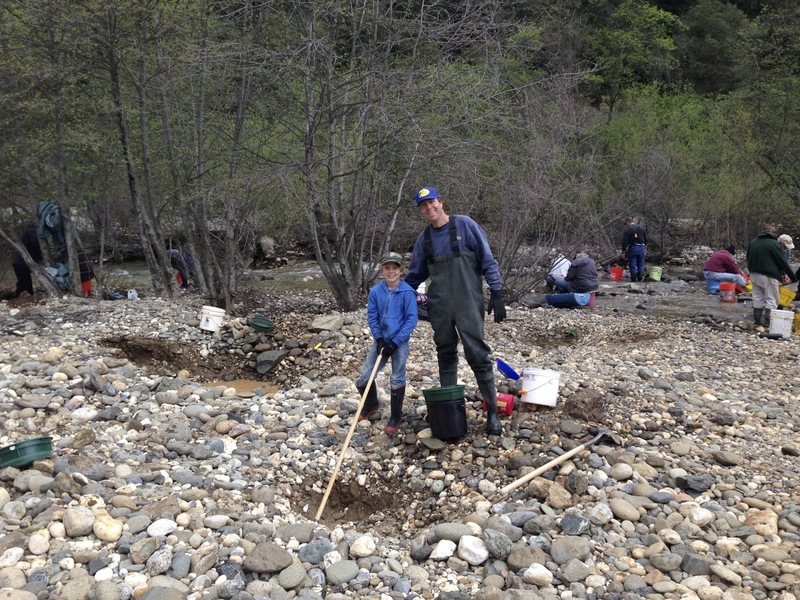 On that Memorial Day, Hudson had decided to take his wife, brother, kids, and some friends out for a day's outing on his placer claim in Chariot Canyon. 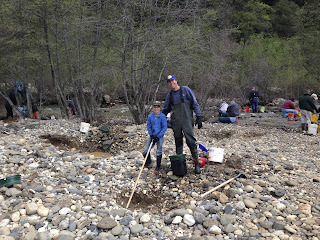 Hudson's plan for the day was to have his friends follow him up to Chariot in their vehicles and then the group would enjoy a day of sluicing and gold panning followed by a picnic and some target shooting. From what I could gather about the weapons involved (and they're vague as is everything else), Hudson and his eventual antagonists were armed with a variety of weapons of various calibers, including a machine pistol of some sort, a shotgun (gauge not given but probably a 12), a hunting rifle (30-30 or 30-06? ), and a target rifle of unknown type or caliber. 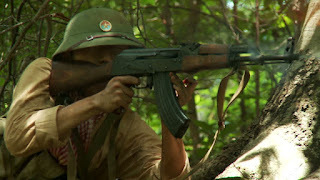 Hudson himself had brought along his trusty AK-47 assault rifle (7.62 mm), a very unpleasant weapon which I'm very familiar with from my Vietnam days. Other than Hudson's AK it's unclear exactly how the weapons were distributed among the antagonists, but there was plenty of firepower to go around, and I suspect the majority of it was in the hands of Hudson and his friends based on the fact that they comprised a small group while the soon-to-be dead men only amounted to two individuals, Christopher "Chris" Zerbe, 34 and Edward John "Joe" Lopes, 66, both of whom lived in the nearby town of Julian. Chris Zerbe was employed as the "caretaker" of a small hard-rock gold mining operation and claim owned by a man named Benjamin Haimes who resided in Encino, California. According to statements given by Haimes he had invested over $250,000 in improvements to his mine (personally I find this hard to believe for a small-scale operation but who knows?) and didn't want any more "trespassers" on or near his claim. Thus Chris Zerbe's presence on that fateful Memorial Day. Joe Lopes, on the other hand, had no employment connection to Haimes but was a friend of Chris Zerbe. This is a good time to interject the following: Gustav Hudson's placer claim lay close by to Haimes's hard-rock venture. 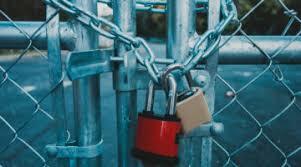 But there was a heavy wrought-iron gate (usually locked) and fencing at the entrance to Chariot Canyon. Who put that gate in is open for debate since I myself don't know. What I do know is that the U.S. Forest Service often puts such gates in place and if you're a claim owner you must get a key from them to enter that ground. (This is what I had to do with my last claim in Northern California, by the way.) Since Chariot Canyon and the old mine workings there present a certain historical significance to San Diego County and the old mining town of Julian, perhaps the locked gate and fencing was there to keep "Looky Lous" from falling down an old mine shaft and/or to prevent vandals from destroying the place. Who knows? Either way this gated entrance became the focus for what would happen on that Memorial Day in 1989. I will have to resist the urge to google to try and find out what happened. Hang on Don. The full story will be coming soon. as gold went up in 1980, myself and 3 other fellows in Albuquerque,NM took a trip to Alaska. We left mid May, 1980. We spent most of the summer dredging with a Keene 4 inch super dredge with a Hookah setup. I did most of the diving, as the others couldn't take the cold water. Very interesting experience indeed. Barely made bean money until towards the end of our trip when we got 27 ounces in a couple of days. There was a shooting in Arizona about the same time as your story. Fella was killed over a claim dispute . I don't remember the details. Any how, looking forward to more! You guys killed it in Alaska Jim.! 27 ounces ain't no small amount of gold. I didn't hear about the murder in AZ but there was another one near Goodyear's Bar in the 1980s when I was working not far south of there on the N. Yuba. I haven't had a chance to look at this until now...….now I'm glad of it! 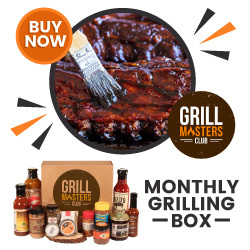 I don't have to wait! For once being slow worked out!! HA! My father was mining in the sixty's , he was no "newbie". And if you mean to say defending your family is antagonistic then yes he and I are very antagonistic. Also dead men tell no tales rings true here but hard facts and evidence do. Thanks for your comments and clarification.